Official size 24-sport ball pack. Four of our popular sports balls. Each in six great Spectrum™ colors. 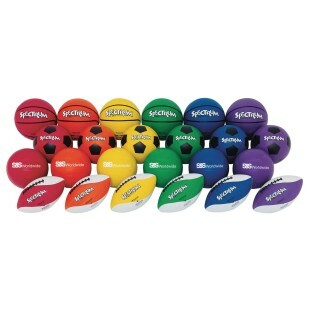 Official Size Spectrum™ Sports Ball Pack contains 24 balls. An official size and weight football, basketball, volleyball, and soccer ball in six of our Spectrum™ colors: red, yellow, blue, green, orange and purple. Balls ship deflated to save shipping cost and minimize cardboard usage.